In a medium bowl, combine masa, salt, and baking soda. Stir in oil and water. Knead until a thick dough forms. Add additional masa harina or stock to adjust the consistency. Roll the dough into golf ball-sized balls and set aside. Start pressing and cooking tortillas. Press the dough between two sheets of wax paper in a tortilla press, or between two heavy, flat plates. 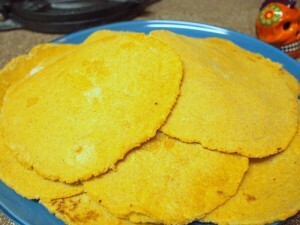 Use a flat spatula to peel the flattened tortilla off the wax paper and place in the hot skillet. This is when it is handy to have a friend help with the cooking while you continue pressing. Cook the tortillas about 30 seconds to 1 minute on each side. Transfer to a plate and cover with a dish towel. Continue until all of the prepared masa is used. Use immediately in enchiladas, tacos, or as a side, or store in an airtight bag at room temperature. If the tortillas become stale before you can use them consider making chilaquiles or migas.